Like many new investors, you've decided to invest in a company and pick up your first shares of stock, but your limited knowledge leaves you wondering how to do it. Don't worry! This overview was designed to help you learn precisely that - how to invest in stocks. To be more specific, for you new investors, this page was put together to serve as an introductory depository of investment articles designed to get many of the basics out of the way before moving on to some of the more advanced topics which I've written over the past years. I created it as part of The Complete Beginner's Guide to Investing in Stock, and it provides a short checklist of topics, complete with links to much more in-depth articles, where you can study whatever it is you want to research about investing in stock. Once you are ready to move on from these resources, you can check out the nearly 1,000 articles I've written on this site as well as the thousands of articles I've posted on my blog, which covers more advanced business, finance, and investing topics. Investing through a 401k plan or, if you work for a non-profit, a 403b plan. Investing through a Traditional IRA, Roth IRA, Simple IRA or SEP-IRA account. Investing through a brokerage account. Investing through a direct stock purchase plan or dividend reinvestment plan (DRIP). Common Stocks – When you invest in stock, you acquire an ownership stake in an actual operating business, along with your share of the net earnings and resulting dividends produced by the firm. Although you don't have to invest in stock to get rich, over the past could of centuries, equities (stocks) have been the highest returning asset class and have produced the most wealth. To learn more, read What Is Stock? which will break down the fundamentals. Preferred Stocks – Preferred stock is a special type of stock that often pays higher dividends but has limited upside. Bonds – When you lend money to a country, municipality, business, or other institution, you buy bonds such as corporate bonds, municipal bonds, savings bonds, U.S. government Treasury bonds, etc. Money Markets – Money markets are highly liquid investments that are designed to protect your purchasing power. They are considered a cash equivalent. There are two varieties, money market accounts, and money market funds. There are also at least five other alternatives to money markets. Real Estate Investment Trusts (REITs) – REITs are a special type of company designation that allows no taxation at the company level provided more than 90% of earnings are paid out to the shareholders. The assets are often invested in a variety of real estate projects and properties. The Form 10-K – This is the annual filing with the Securities and Exchange Commission (SEC) and is probably the single most important research document available to investors about a company. The most recent Form 10-Q – This is the quarterly version of the Form 10-K.
Proxy Statement – The Proxy Statement includes information on the Board of Directors as well as management compensation and shareholder proposals. The most recent annual report – While reading the annual report, you'll want to pay special attention to the letter from the Chairman, CEO, and sometimes CFO or other high-ranking officers to see how they view the business. Not all annual reports are created equally. Generally, the best in the business is considered to be the one written by Warren Buffett at Berkshire Hathaway, which you can download from free on the holding company's corporate site. A statistical showing going back five or ten years. Several firms prepare this type of information in easy-to-digest formats, mostly for a subscription fee. Some of the major research houses and products include Morningstar, The ValueLine Investment Survey, Standard and Poor's, and Moody’s. 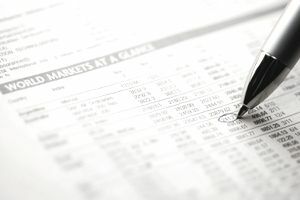 All three financial statements work together and reinforce one another - you cannot study them in isolation, or you'll find yourself making decisions based on partial data; a mistake that can be costly, especially when you decide to invest in stock rather than a more senior security higher up in the capital structure, such as a bond. Finally, there are some things you’ll want to look for in a company and its management before you buy shares of stock. I expand upon these tips in the articles listed below. Also, here are a few more articles you'll find helpful in your investing journey. If you want to learn more about how to invest in a stock, check out the directory of Investing for Beginners articles I've written, sorted by topic or head over to my blog for more esoteric and advanced topics that aren't particularly appropriate for beginners. Whatever happens, remember that stocks are just one of many types of assets that you can use to build wealth and become financially independent.